A closer look at the vines, a visit to a great producer in the region, and the future for Beaujolais. Part Two of a special report. Beaujolais is a very interesting region administratively. Three-quarter of it is located in the Rhône-Alps and a quarter of the best Beaujolais crus are located in Burgundy. As a narrow strip of land between the mountains and the river, there is a huge difference in climate from north to south. The south is warmer. In the north, there are cold winters and frost problems. These cold winters can freeze any water contained in the soil and de-compact it. When the temperature warms up in spring, the frozen water will melt and sink back into the ground. The cold Minstrel wind from the north also contributes to the climate. My contact was Pauline de Castelnau, daughter of a Beaujolais winemaker and resident. Pauline runs the Back to Beaujolais wine tours. She is extremely passionate about Beaujolais and has a deep desire to promote the region as a contender for wines to be taken seriously. I have been impressed by her connectedness to the region, her professionalism and attention to small details. I do not know if a glass of Beaujolais will allow one to live longer but I do know this: that Beaujolais is a wine that comes with the tradition of music, of laughter and of happiness. It is a drink of festivity and of conviviality. In my travels, I found that different wines bring out different aspects of a person. For Beaujolais, the wine brings out some of the very best things from the people in this region and I have had the opportunity to experience this first-hand through my interaction with the vignerons and merchants here. The people here are serious about their wines but at the same time, light-hearted and genuine, just like the wine produced. Our first stop was on the top of the Côte de Brouilly. The soil here ranges from dark green to black, containing remains of volcanic rock and a blue stone called Andesite, which plays a role in imbuing the wines here with special characteristics. It is hard to imagine how anything can thrive on soils that are so infertile but for the vine, this is the perfect soil. The vines are on US root-stocks. Erosion does happen at times which is why earth and mud at the bottom of the slopes are needed to be carried up. The vine density is ranges from 6000 vines/hectare even up to 10 000 vines/hectare. 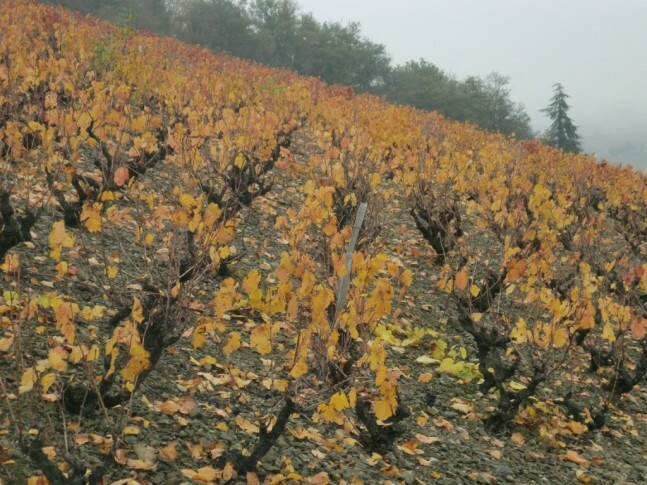 The goblet system of pruning is mostly used on these slopes which are inclined up to 45 degrees. The vines are planted with around 0.9 meter vine spacing and 1.2 meter row spacing. This is a very ancient method of growing vines which does not utilise any wires. 3 to 5 arms would stick out from the ground to form a shape of a goblet. On each arm, there would be about 2 canes. The shoots would grow and eventually, they would be tied together at the tip, forming an empty pocket in the center of the vine. 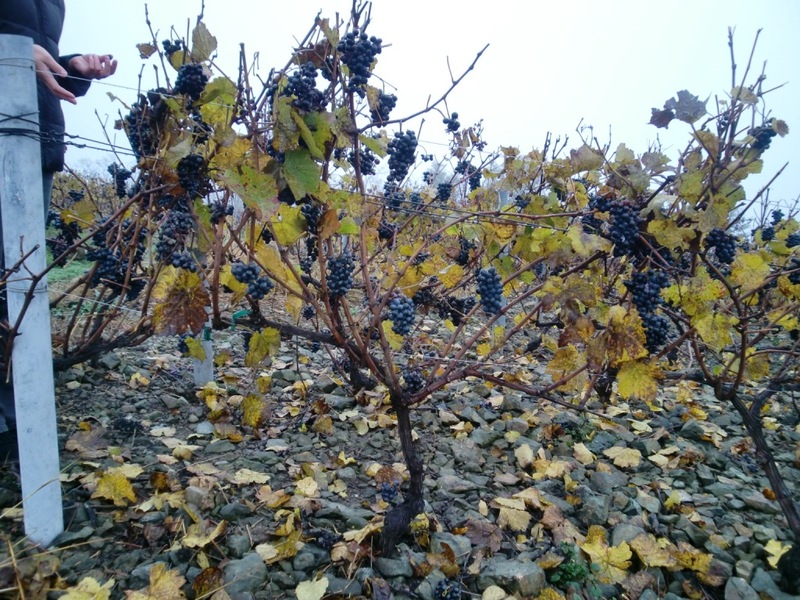 According to AOP rules, a maximum of 10 buds are allowed on each vine and harvesting has to be done by hand. Due to problems with canopy management and disease pressure, the goblet system is slowing being replaced by double cordons with wires. This makes it easier for machines to do the pre-pruning of the vines as well as work the soil. With the goblet system, machines pose a problem especially since more goblet-trained vines are on slopes and are disorganised. Pesticides and herbicides are still used but the region is changing to organic practices. Copper is also sprayed here to prevent mildew problems, which happens from time to time. There are hardly any problems with birds as the plantings are low although there was a bout with a worm called pyraleduring the mid-90s. The average age of the vines is 40-50 years old. Rainfall is about 741mm per year. According to Pauline, 2009 was an exceptional vintage, full of concentration and colour. 2010 was also another good year but still needed time in the bottle. This year, 2011, was a great vintage once again. Spring this year was hot and dry and there was a lot of rain in July but then came a warm August, leading to the harvest starting on the 25th August. Our first stop was to visit Daniel Bulliat, who not only produces his own wines, but is also the President of the Beaujolais and Beaujolais-Village Appellations. Daniel produces Nouveau, Beaujolais and Beaujolais village wines but also four different crus – Morgon, Chirouble, Côte de Brouilly, and Régnié. Régnié is the youngest of all the ten crus, only becoming one in 1988. Since the market for Régnié is not as developed, some would bottle it under a villages to sell. The other 9 crus can be sold under the label of Burgundy Gamay. Each producer is allowed to use up to half of their output for Nouveau. Historically, Beaujolais was linked closely to Burgundy. Before the Nouveau phenomenon, back in the early century, prices of Burgundy and Beaujolais were almost the same. But after nouveau came along, it reduced the image of Beaujolais wines into that of an affordable quick quaffer – a wine that that cannot be aged for long. However, with the popularity of Nouveau, Beaujolais was set on the world market and selling Beaujolais was not difficult at all. These did not do much for the crus which still did not become as well-known as their Nouveau counterparts. Meanwhile, Burgundy too rose in status and prices on the international wine market, although the wines were viewed to be of more prestige than Beaujolais. Today, the situation for Beaujolais is looking dismal. With the trend of Nouveau coming to an end, Beaujolais has to look at other means to prop up its sales. 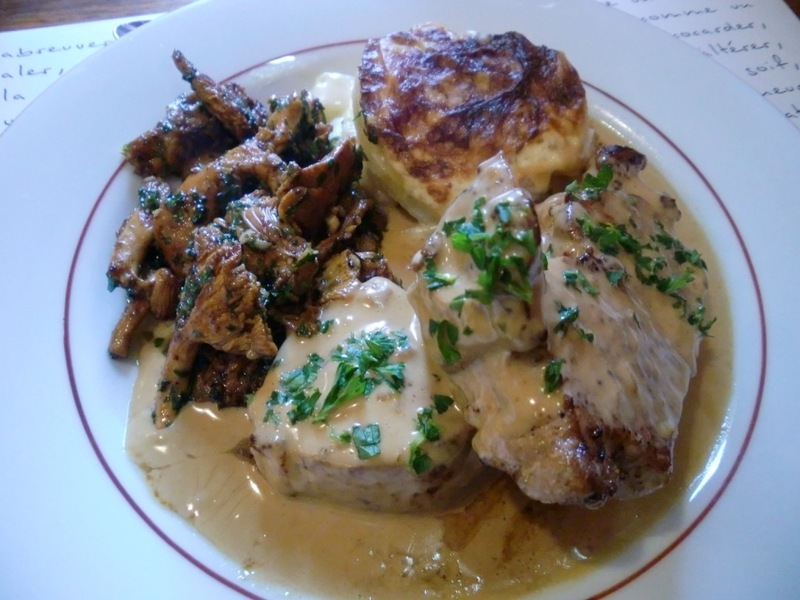 According to Daniel, there have been ongoing negotiations with Burgundy that as early as 2012, wines from Beaujolais to Auxerre are allowed to use the term Côteaux Bourgogne on their label. This new title is needed to make clients understand the difference between Nouveau and long aging wines of Beaujolais. It is done to ride on the marketability and salability of Burgundy. The same direction is intended for Gamay Bourgogne, white Beaujolais and Crémant Bourgogne. With the current sales of Crémant Bourgogne jumping from 14 million to 22 million cases, Beaujolais wants to be part of the profit. They are even talks to have Pinot Noir planted in Beaujolais so as to qualify to have Bourgogne on the label. The Beaujolais crus will not be using the Côteaux Bourgogne label although Beaujolais and Beaujolais Village will do so. 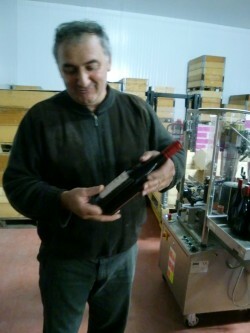 As the bottling machines were running on the background, I noticed corks on the Beaujolais Nouveau bottles. I asked Daniel what was the point of using corks when the Nouveau were to be consumed early. It would be cheaper to use screw caps. Daniel replied that it was not only an image thing, but the difference was not much – around one to two cents difference. Perhaps the abundance is still not high in France that the cost of using screw cap is still high. Personally, I have not seen any producer put in so much work to create a bottle of Nouveau. From speaking to Daniel, he came across to me as a man who believes that if he were to put his name on every product, then it better be a good one, even if it were Nouveau. He went on to mention that about last year, the harvest finished on the 6th October for him. He lost 20% of his sales for Nouveau last year as he always resisted the pressure of making wines fast. While his competitors would perform the malolactic fermentation (MLF) while the alcoholic fermentation is running, he preferred doing the MLF after the primary ferment, which takes more time. He feels that by running both conversions at the same time, the wine becomes drier and it feels less fat on the mouth. The macerations for Nouveau wines are shorter than his Village or crus, lasting about 3 to 4 days of semi-carbonic maceration. There is no pumping over or pigeage being done. Daniel believes that a top Beaujolais Nouveau is fruity and floral, and on the palate is it round with a firm structure. To achieve this, he uses 3 tanks to do the ferment. One tank is adjusted to ferment the juice at low temperatures of 14 to15 degrees Celsius, retaining all the aromas. The other two tanks will be at higher temperatures to extract more colour and body at the expense of aromas. These two tanks are allowed to go up to 35 degree Celsius for up to 24 to 36 hours before pressing. After 3 to 4 days of macerations, the whole bunches are removed from the tank and pressed. The pressed juice is then reunited with the run-off juice to finish the alcoholic ferment.As a proponent of long fermentation, his Nouveau would last for around 14 to 15 days for the entire alcoholic fermentation. Daniel believes that longer ferments give more voluptuousness to the wines with the higher glycerol levels. After that, the MLF should last for 2 to 3 week in the tank.Finally, the wines will be blended to create Daniel’s perfect Nouveau. For the Village and cru wines, pigeage is done once per day followed by two pump-overs. The crus go through two weeks of maceration before pressing. A platform constructed from wood shaped into a hex is plunged down so that the cap can remain submerged while the juice seeps through the openings of the platform to cover the cap completely. 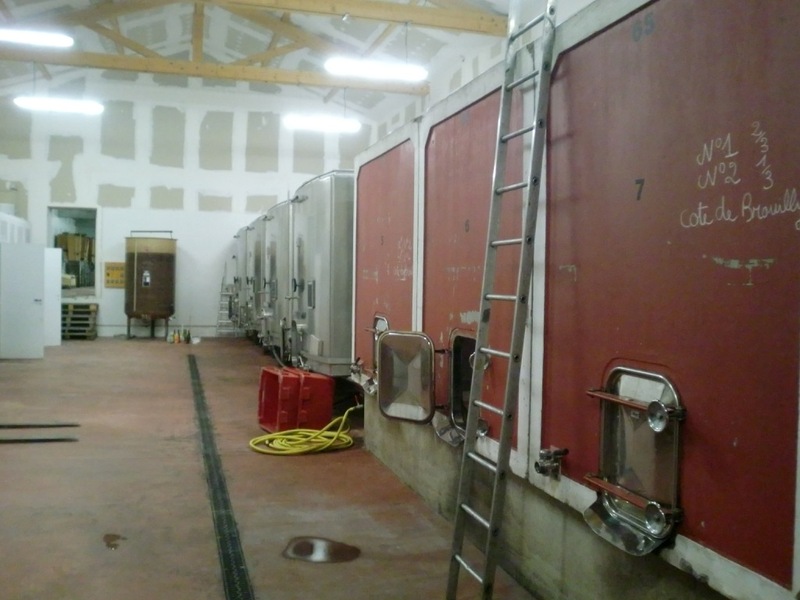 All his wines from Nouveau to the crus are filtered once with diatomaceous earth. Sulphur is minimal, at 20 ppm. Almost transparent purple.A lifted and rounded nose, med plus intensity, kirsch, ripe cherries, a slight earthiness to it. A med(+) acid and med alcohol. Lots of cherry on the palate like a fruit bomb, med(+) tannins, chalky and grainy texture, a long length with lots of raspberry and kirsch in the back. There is a fruity raspberryish style in the middle palate. Semi-transparent purple.More intensity in colour.Medium intensity on the nose.Slightly closed and red compote, a light bubble gum. High tannins, drying texture, a med(+) acid and alcohol, lots of body, blackcurrants, long length, blackcurrant finish. Semi-transparent Purple. Lifted but peaches, sweet confectionary notes, very subtle smells of red fruit basket. On the palate, med tannins and alcohol, grainy and sandpaper textures, full of redcurrants, med(+) acid, med(+) length, subtle berry finish. Next, we will take a look at Château Thivin, which uses a completely different set-up from Daniel’s.